The product to be packed shall be manually collated in pusher jaw assembly. Thereafter, the operator has to press the push buttons provided on both side of the pusher assembly ( pl. note that the pusher jaw does not activate , unless pushed buttons pressed). The product is then pushed between the two film rolls located on top & bottom, forming web of the film on package. On return of the pusher jaw, the front seal head activates and seals / cuts the film. During sealing / cutting operation , the operator remains ready with the next package, and cycle repeats. While all of this is in process, the first package is pushed into the Shrink Tunnel conveyor automatically by next package. The shrink tunnel is heated by means of SS tubular finned heaters and the hot air is circulated by a turbo fan. The tunnel conveyor has a variable speed drive unit positioned in the control panel. The temperature of shrink tunnel & sealing bar is controlled by a sensor connected to the digital controller, which permits the total adjustment of the temperature from the outside. After shrinking process, the package is cooled to set the film in its new shape at product cooling unit. Top & Bottom film roll mounting with Motorised unwinding system. Thermostatically Controlled Cutting Sealing Knife. The unwinding of shrink film shall be automatic. Shrink tunnel with twin turbo blower fan assembly. Emergency Switches & all Safeties shall be Provided. 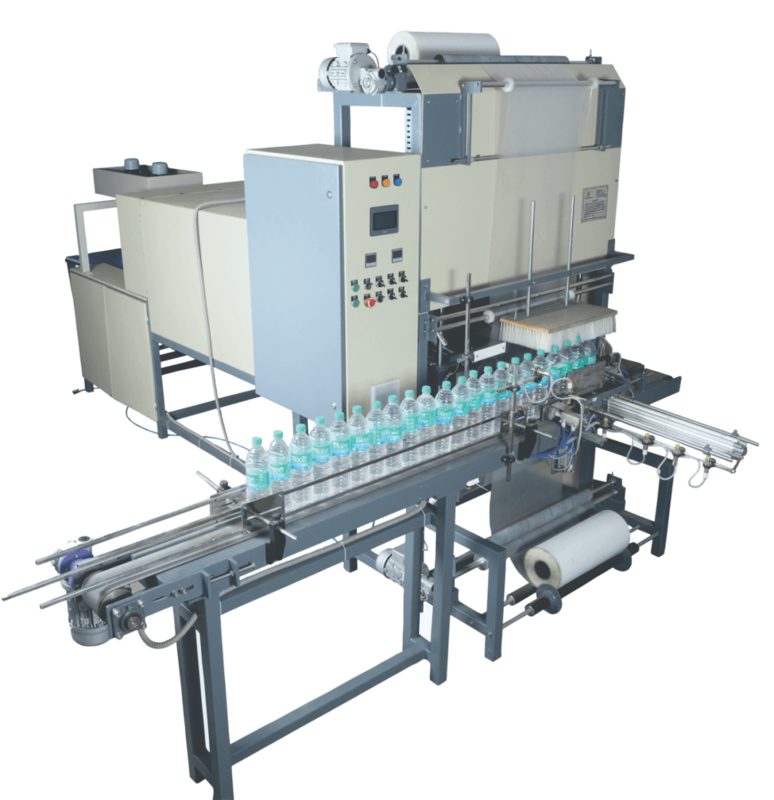 Side guider & Top Guider system shall be provided to guide the bottle.